Find Downtown Indianapolis, IN Homes for sale. View Photos, Maps and MLS Data Now! Take advantage of this rare opportunity in Fountain Square while it lasts. MLS#21634947. Malone Realty. Easy commute to Eli Lily, Downtown, Fountain Square, & I65/I70 MLS#21635310. My Agent. Once completed, interior pictures will be posted. MLS#21635299. House to Home Realty Solutions. Owner is fully rehabbing two houses right next to this one. MLS#21635307. House to Home Realty Solutions. Quality finishes throughout with great attention to detail, convenient location and in one of the hottest neighborhoods in the city, there's so much to love and a ton going for this home! MLS#21634946. Keller Williams Indy Metro NE. The Old Southside neighborhood is the new target of Indianapolis Mayor Joe Hogsett’s community development investment program, Lift Indy, which will direct about $4 million in investment to the area over the next three years. Get in while you can! MLS#21632597. Plat Collective. Walkers - Newer windows, shower HVAC, appliances, washer dryer, fresh paint. MLS#21633231. Everhart Studio, Ltd.. 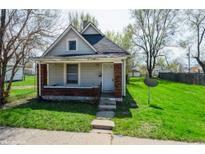 Ideal Rental Property for an investor! 2 bedrooms and 1 bath. MLS#21633823. Carpenter, REALTORS®. Please see agent remarks for updates! MLS#21633398. Keller Williams Indpls Metro N.
Elegant master suite w/ giant walk in closet & spa-like bath is sure to wow - especially if size, functionality & finish are on the wish list! MLS#21631215. Plat Collective. Dumonts - New HVAC in 2017, Roof 2014, fresh carpet on the second level, and newer hot water heater. MLS#21633343. F.C. Tucker Company. Brookside Park - Ring doorbell stays with the home. MLS#21633602. RE/MAX Ability Plus. Fenced-in backyard for entertaining, and a spacious detached garage complete this great home! MLS#21633782. CENTURY 21 Scheetz. Many renovations and new construction builds have already sold up and down the block for 300-400k. MLS#21633184. Keller Williams Indy Metro NE.